An optimist might say: It’s not over until a Sedin gets injured. A realist might shrug his shoulders at the suggestion, because the Canucks still have some gaping holes to fill offensively, even with the Sedins in the lineup. As an outsider, you might look at the Canucks injury list and think that they’ve been fairly lucky up front. By this time last year, they had basically lost their second-line centre for the rest of the season, throwing the roster out of whack. Both Bo Horvat and Jared McCann were thrust into roles that they weren’t ready for. 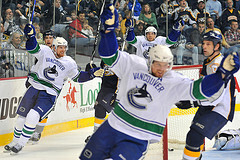 However, the Canucks still managed to stay in playoff contention for the following three months. If either Sedin twin gets injured, the Canucks are in a world of trouble. (Danielle Browne). As of this writing, Jannik Hansen and Derek Dorsett are the only two main forwards missing in action due to injury. The loss of the underestimated Hansen really hurts the Canucks. He hasn’t just turned into one of their best goal scorers (take that as you may), but he’s become a vocal leader for the young core, and a heart and soul player for the organization. Again, at least it isn’t a Sedin injury. The loss of Dorsett doesn’t nearly have as much of the same impact, even though his play hasn’t been poor. He’s currently sporting a career-best 53.5% Corsi For through his first 14 games, miles ahead of his career average of 46.8%. However, he’s still only registered four points while skating for less than ten minutes per game. Even though only two forwards are missing from the roster, it feels like the Canucks have only half a team on the ice. Four players in the current forward corps could currently be considered fringe NHL players. It has hurt Willie Desjardins’ ability to roll four lines late in games, giving him a disadvantage against deeper teams. Jack Skille was signed by the Canucks after a strong preseason in which he didn’t register a point, but skated hard and finished all of his checks. He looked good against glorified AHL preseason rosters, but he has failed to make much of an impact at the NHL level this season. Many expected Brendan Gaunce to step into an NHL spot after nearly making the team a season ago. After another strong training camp this fall, he cracked the opening night roster. Despite a revolving door of forwards on the fourth line, Gaunce has suited up for every game. He’s failed to make much of an impact on the scoresheet and notably has failed to be on the ice for a goal this season. However, his defensive game looks good, and only Alex Burrows has a better goals against per 60 minutes at even strength. Hopefully, Gaunce’s strong defensive game will eventually turn into offence, but don’t count on it. Michael Chaput and Jayson Megna represent the other two AHL call-ups who have seen significant action in place of some other injured forwards. Chaput, in particular, has found himself centering a line with Markus Granlund and Loui Eriksson. He only has one assist in eight games despite playing with actual NHL players. Neither forward has played horrendously, but a team with greater depth likely wouldn’t be forced to play these two forwards. When analyzing the Canucks roster during the preseason, there were two forwards who many pointed out as potential x-factors . One was Anton Rodin, who despite a strong preseason, aggravated his gruesome knee injury from January, which has forced him to miss the first 20 games. It’s an unfortunate situation for the promising Swede, who has an uphill battle even if he doesn’t make his debut in a Canucks uniform. He is already behind in game-speed, with the season at the quarter pole. That’s a daunting scenario for a player who has yet to play an NHL game. The second supposed x-factor was, or perhaps still is, Jake Virtanen. There were high hopes for the 20-year-old to take his game to the next level this season. Despite registering only 13 points in 55 games last year, he showed a promising defensive side to his game and brought a physical presence that the Canucks severely lack. He failed to make an impact through 10 games this season and was sent packing with his stuff to Utica. His role with the organization has been a tantalizing topic in Vancouver, and loads of questions surround his situation. 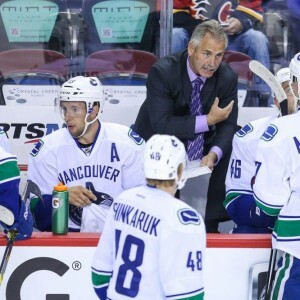 Was he given a fair shake by Willie Desjardins? Is he at odds with the coach? Is Utica the right place for him? Did the Canucks make a mistake by drafting him? The only thing Virtanen can do now is to make the most of his time in Utica and earn a call-up back to the Canucks. He is surely a better option than wingers like Skille or Megna, which makes his demotion all the more frustrating. However, it’s not a negative experience for a 20-year-old to earn loads of ice time in the AHL. 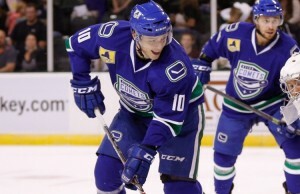 With so many Utica Comets succumbing to injuries, Virtanen will get his shot on the farm. Perhaps everybody except for Jim Benning? Henrik Sedin claimed earlier in the season that the Canucks had better depth than last year. Maybe he was just talking about the defence. With a healthy lineup, the Canucks roster looks decent. But with just a couple players missing from the lineup, the Canucks are only icing three NHL lines, and have an AHL-calibre player centering a line with their prized offseason signing. Not much was made about waiving Emerson Etem, even though they lost him for nothing when they easily could have waived Skille. For a team with poor forward depth, the move is puzzling. It could always be worse. If a Sedin get’s injured, the Canucks’ offensive depth will look thinner than a piece of tissue paper in a rainstorm. If one or two of the bottom four forwards start to overachieve, then this scenario starts to look a lot different. Until then, many should be questioning Benning for his inability to add some quality bottom-six forwards to the team, especially when forwards such as Jon Marchessault, Teemu Pulkinnen, Sven Andrighetto, Seth Griffith, and Brandon Pirri were all available either via free agency or on the waiver wire. The Canucks might be going through some rebuilding pains, but much of that pain is self-inflicted.